The use of transition metal chlorides for the oxidation of triethylsilane to triethylsilanol in the presence of tert-butylhydroperoxide is reported. It is shown that the process is sensitive to the type of a metal catalyst and the reaction conditions. Among the metal salts explored, CuCl2 is found to be the most selective and, therefore, the most suitable catalyst for the process described. An appreciable level of activities observed in the case of other transition metal salts, in particular, MnCl2 renders further studies in this area very promising. Key words: silanols, peroxides, metal-catalyzed oxidation, hydrosilanes, silanes, homogeneous catalysis. The versatile properties of silanols (analogs of organic alcohols) promote their extensive use in different fields of chemistry and related sciences, ranging from fine organic synthesis and catalysis to the chemistry of high-molecular compounds and biology . 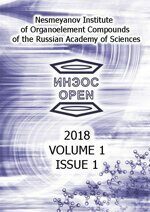 For example, investigation of the biological activity of this class of organosilicon compounds  revealed their considerable potential as bactericide and antiseptic materials . Furthermore, silanols were shown to be useful building blocks in the construction of high-molecular compounds with predefined structures , including dendrimers . In recent years, increasing attention has been drawn to the catalytic activity of these compounds and their application in organic synthesis . Despite the wide application scope of silanols, the development of approaches to their synthesis remains an urgent problem. The main method in use, namely, the hydrolysis of chlorosilanes does not meet the modern principles of green chemistry. It is also limited by the choice of the starting compounds due to their low availability and the high sensitivity of the method to various functional groups. Another challenge resides in the low stability of silanols in the reaction medium, which leads to the formation of disiloxanes as the main by-products. A rising alternative to the conventional synthesis of silanols from chlorosilanes is the catalytic oxidation of hydrosilanes in the presence of oxidizing agents and various catalysts . Although this method is advantageous in terms of functional group tolerance, even the use of hardly accessible or noncommercial oxidants and catalysts often fails to solve the condensation problem. Recently we have suggested a preparative method for the synthesis of alkyl- and siloxysilanols based on the oxidation of the corresponding hydrosilanes in the presence of inexpensive commercially available reagents, namely, copper carbonate as a catalyst and tert-butylhydroperoxide as an oxidizing agent in acetonitrile at 80 °C . In view of the discovery of an efficient catalytic system, it seemed interesting to screen the related types of metal catalysts in order to extend the potential of the method. In this context, we decided to estimate the catalytic performance of other 3d metal salts (MnCl2, CuCl2, NiCl2, CoCl2, and FeCl3) and cerium(IV) ammonium nitrate (CAN) (Table 1). The latter is a rare-earth metal catalyst that is widely used in oxidative processes in combination with tert‑butylhydroperoxide . The salts of these metals were selected owing to their lower cost compared to the platinum group metal derivatives ([Ru], [Rh], [Pd], [Re], [Os], [Ir], and [Pt]). First, the activities of the metal salts were evaluated upon heating in benzene at 100 °C. None of the compounds provided the complete conversion of triethylsilane 1 under these conditions (Table 1, entry 1). The most active catalyst appeared to be MnCl2 which afforded the highest conversion of 1 and 87% yield of triethylsilanol 2. NiCl2, CAN and CoCl2 were slightly less active and provided comparable conversions of the starting silane with good yields of product 2 (82–83%). The high level of selectivity was observed almost in all cases (except for FeCl3): the content of disiloxane 3 in the resulting mixtures did not exceed 10%. Table 1. Effect of the nature of a metal salt catalyst on the yield of triethylsilanol 2 upon oxidation of triethylsilane 1. Earlier we have shown that a reduction in the amount of the copper(II) catalyst from 20 to 0.5 mol %, the variation of its anion nature, a decrease in the reaction temperature from 100 to 80 °С, and the use of acetonitrile as a solvent instead of benzene can enhance the yield of triethylsilanol 2 from 57 to 90% . Therefore, we performed a series of experiments under these conditions (Table 1, entry 2), which revealed that the oxidation process occurred generally more efficiently, but less selectively . In particular, in the case of CAN and CoCl2 the reactions mixtures did not contain the starting triethylsilane 1 after 24 h of heating, but the concentrations of the target triethylsilanol 2 were only 42% and 56%, respectively. However, it was found that triethylsilane 1 can be converted to triethylsilanol 2 in 88% yield using CuCl2. All the starting compounds were purchased from Acros or Sigma Aldrich. The solvents were purified and stored according to the standard procedures. Analytical gas liquid chromatography was carried out on a Kristall-2000M chromatograph using a catharometer as the detector, helium as the carrier gas, and Chromaton-H-AW containing 5% of SE-30 as the sorbent. The column length and diameter were 1 and 0.003 m, respectively; its temperature ranged within 50–330 °C. The reaction conditions for entry 1, Table 1 were as follows. A stirred mixture of triethylsilane 1 (0.1 g, 0.859 mmol), the mentioned metal salt catalyst (0.172 mmol, 20 mol %), a 70% aqueous solution of tBuOOH (0.1549 g, 1.719 mmol), and benzene (1.00 mL) were heated in Schott culture tubes (160 mm × 16 mm) at 100 °C for 24 h. The Schott culture tubes were sealed with septae, so that the reactions proceeded in isolated systems without removal of the solvent vapors. The contents of compounds 1, 2 and 3 were determined by GLC. Hence, the use of transition metal chlorides for the oxidation of triethylsilane in the presence of tert-butylhydroperoxide was justified in general. Depending on the reaction conditions, the salts under consideration ranked by the selectivity of oxidation of triethylsilane 1 to triethylsilanol 2 in the following series: FeCl3, CuCl2, NiCl2, CAN ~ CoCl2, MnCl2 (Table 1, entry 1) and FeCl3, CAN, NiCl2, CoCl2, MnCl2, CuCl2 (Table 1, entry 2). Although CuCl2 was found to remain the most selective and, therefore, the most suitable catalyst for the process described , an appreciable level of activities observed in the case of other transition metal salts, in particular, MnCl2 and the process sensitivity to the type of a metal catalyst and the reaction conditions render further studies in this area very promising. This work was supported by the Russian Science Foundation (project no. 14-23-00231).